The Northern Hemisphere is in the depths of its winter season. Last week’s polar vortex that plunged much of the US and Canada into subzero headlines made international headlines. Temperatures that cold hadn’t been registered in many places in two decades. The deep freeze was made possible by an intense blocking pattern over Greenland and a wobbly jet stream that plummeted polar air from the arctic to North American mid-latitudes. Imagining a similar scenario where arctic air spills into Eurasia, and specifically the Middle East, is not only a plausible one (hence, the first snowfall in Cairo in 100 years this past December), but is a devastating scenario for over 8.8 million refugees and Internally Displaced Persons (IDPs) currently uprooted by the Syrian humanitarian crisis. The prospect of a harsh Syrian winter is something the international community has been planning for over the last several months. In 2011, the Government of Turkey and the Turkish Red Crescent gained experience in wintertime operations by providing emergency support to victims of the Lake Van earthquake during a brutal snowfall season. Last year, Jordan, Lebanon, UN Agencies, and NGOs provided shelter retrofits, camp support, clothing, and food to thousands of Syrian refugees. 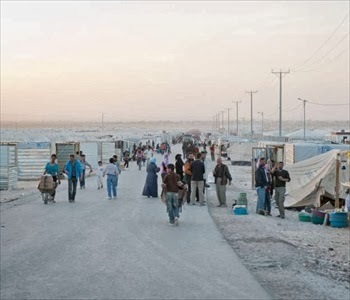 And intensive operations led by organizations such as Oxfam as well as UNHCR and other UN agencies are providing crucial on-the-ground services in Syria and host countries alike. But the main difference for the winter of 2013 is the matter of scale, as Syria’s displacement levels continue at alarming levels. As shown by this outstanding graphic from the European Community Humanitarian Office, between December 2012 and December 2013, the number of Syrians needing humanitarian assistance has increased 230%, the number of IDP’s has grown by 540%, and the number of refugees has skyrocketed by 460%. Overlay this with staggering trend with the highly plausible scenario of another “polar vortex” engulfing the region and that creates a situation for the humanitarian community with no parallels in recent history. By Caitlin Werrell and Francesco Femia in climate and security on January 17, 2014 .